While Japan is sitting pretty with the original Smash Bros. for download on their WiiWare, North America doesn’t get such a nice New Year’s treat. Sure we get stuff, and it doesn’t look half bad, but it doesn’t look half good either. On WiiWare we’ll be receiving Maboshi’s Arcade (Nintendo, 1-3 players, Rated E for Everyone, 800 Wii Points) and Cue Sports – Pool Revolution (Hudson Entertainment, 1-4 players, Rated E for Everyone, 500 Wii Points) and the VC rolls in with Zoda’s Revenge: StarTropics II (NES, 1 player, Rated E for Everyone-Mild Cartoon Violence, 500 Wii Points). I think the best way to describe both Maboshi’s Arcade, which is a puzzle game, and Cue Sports is as simple. Both games look like the run of the mill shovelware that we are sadly coming to expect form these weekly WiiWaree releases. Oh well, at least we get one or two good games a month off WiiWare for now, and at least Cue Sports is made by Hudson who is known for actually designing addictive casual games. 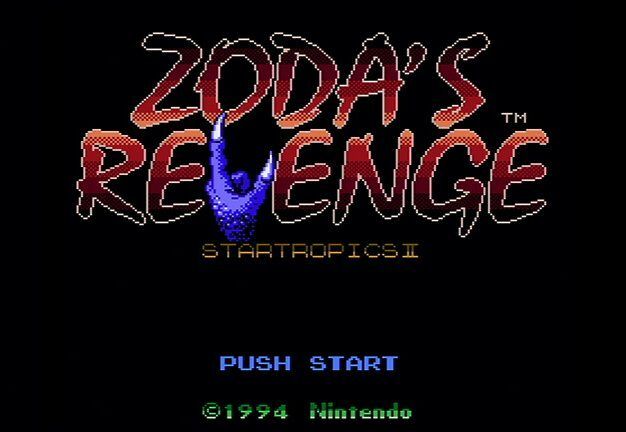 There ain’t nothin’ wrong with Zoda’s Revenge though. StarTropics is one of my favorite series ever and while I dig the original a bit more, 2 had plenty going for it. In fact this might be one of the best releases we’ve had in weeks on the VC. Go download it now, maybe we’ll get another island adventure some day.